You know, before I started dieting and watching my food, I never knew just how bad eating out was for me. I’d just wander on down to Chili’s or whatever and gorge myself on several thousand calories’ worth of fried jalapenos, chicken tenders, and fries and not even think twice. However, now that I know just how bad the food is for me, I can’t even look at a menu without guilt. Before I go eat somewhere new for the first time, I always research their nutritional information online so I can avoid meals like the ones listed in the Center for Science in the Public Interest (CSPI) list of extreme, unhealthy restaurant foods. I’m really impressed by the fact that two Cheesecake Factory meals made the list; however, when you’re eating at a place called Cheesecake Factory, you know what you’re in for. The fact that their pasta carbonara with chicken has 2500 calories is just really impressive; you’d think pasta with chicken is healthy comfort food! 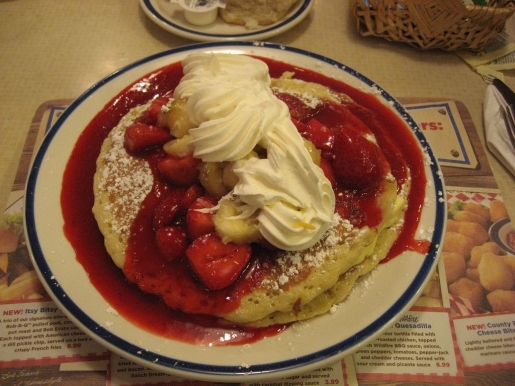 As for one meal on the list I’ve eaten part of, I have to confess: I love Bob Evans Stacked and Stuffed pancakes. I don’t care that one meal has 1350 calories and almost as much fat as a KFC Double Down; that’s some SERIOUSLY good eating. Those pancakes are delicious! I prefer the slightly less-fattening strawberry (about 1100 calories) to the cinnamon cream, though.